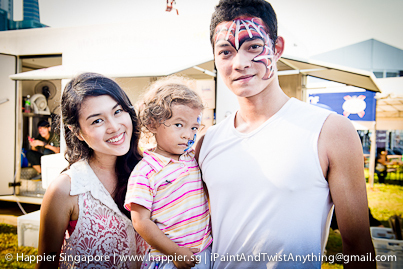 Face Painter @ Extreme Sailing Series 2013 | I Paint and Twist Anything! ← We are all grown up now! The Extreme Sailing Series 2013 gig was the longest gig I have done for the year so far! 7 hours straight in Singapore’s super sunny weather left me in a hot mess. Best of all, a heavy storm came when I packed up at 7.30pm. Luckily my dear boy friend, JS, came to my rescue. By the way, JS is the photographer who took all these awesome pictures. You can see the quality of his shots compared to those in my previous posts! This is my favorite shot of the day because the whole family got their faces painted! 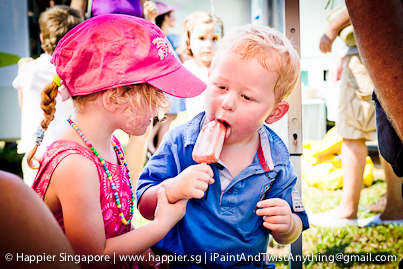 How often do you see a mom joining the queue with her little ones to get her dash of color? 🙂 Plus it’s Mother’s Day tomorrow so it’s time to get into the “mom-appreciation” mode. Big brother is looking all macho in an abstract marvel super hero face paint mask. Look at the intent look in those eyes as I did a Chompy, the shark for him. These 2 sisters must play a lot in the garden. They both requested for cute garden bugs, a caterpillar and bumble bee! Inspired by the recent Iron Man movie! An abstract asymmetrical girly design. She’s a swimmer so I painted her a marine butterfly. The Mr Bean soya food truck was having lull time in mid-afternoon so I had the chance to paint some of their staff. What a small world that Dean and Song Xue both work at the One-North outlet opposite my office! Two sisters feeling V-ictorious with their flower power! Enough of the airy fairies! The Cool girls are in the house! How about a tiger butterfly or abstract leopard? Maybe even a spider girl? Who says only boys can be wild cats? You go girl! Show those Tiger boys who’s the real King! RAWRRR. Ok that was just fantasy play for her. She’s a real sweetie. Won’t you look at that? It’s not just the popsicle melting. My heart is melting too. Happy Mother’s Day to all the mommies out there! May your Sunday be filled with laughter and hugs from the little (or overgrown) ones. I would like to thank you for giving me a chance to paint your lovely kids! To my own mommy, I love you. 😛 So mushy. But whatever. Mom, all the work I do now..from making kids happy..to the personalized way I run the Happier Singapore business..is inspired by you! When I paint, I am in fantasy world of being a mom like you. Every child I paint, no matter how squirmy or dictatorial, I shower with love and patience like you did to Amanda and me. This entry was posted in Events, Face Painting. Bookmark the permalink.